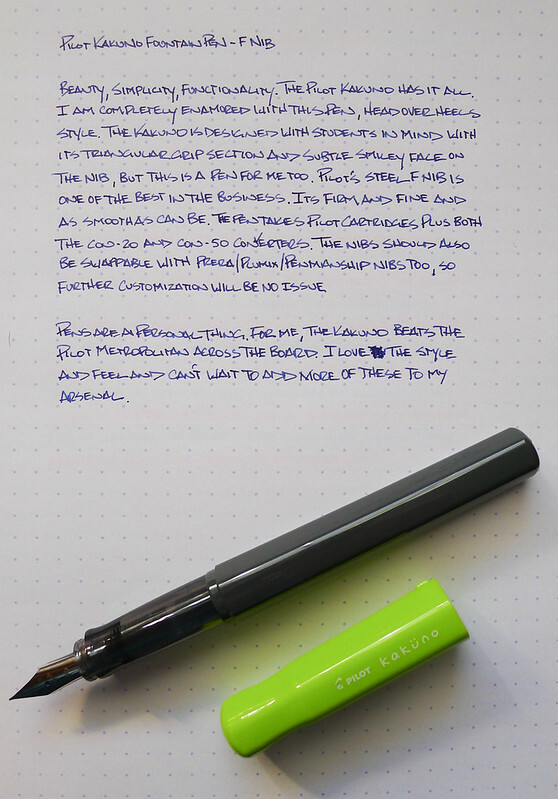 The Pilot Kakuno may not be my number one choice for your first fountain pen, but it is the most fun choice. I love the feel of the pen, and the style is right up my alley. Plus, the nib is a fantastic writer - and it has a smiley face on it! 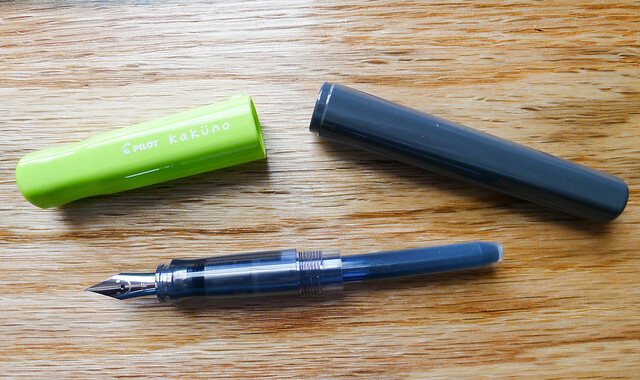 I have one Kakuno to give away: The Soft Yellow model with an extra fine nib. 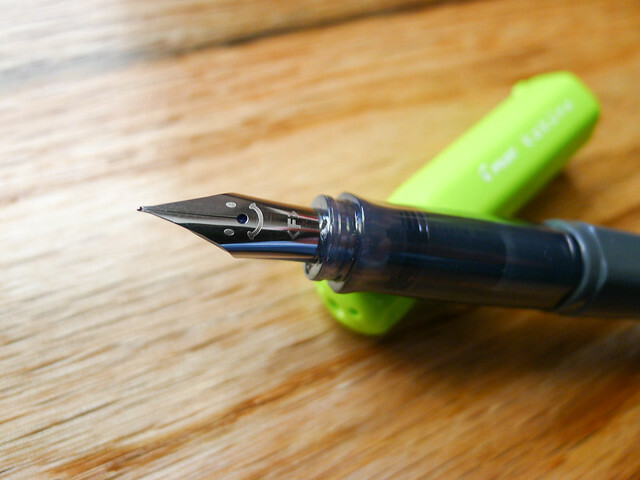 If you want a fountain pen to write like your favorite micro-gel ink pen then this is the one. Read the rules below and enter away! Posted on May 1, 2018 by Brad Dowdy and filed under Pilot, Kakuno, Giveaways. And every time I rattle off that list, I want to add the Pilot Kakuno to it. In all honesty, I think the three above are the best choices going into it blind. But if you want to add the caveat of “fun” into the mix, then the Kakuno may be the best choice. Not only is this pen fun, it functions extremely well. I expect nothing less from Pilot in the fountain pen market, even in the entry level realm. The Kakuno is designed purposefully for beginners. The grip section is triangular in shape to teach you the proper way to hold a fountain pen. The smiley face on the nib teaches you to always keep the nib facing up at the correct angle. Even the hex barrel and cap indention are designed to make the pen easy to handle. From that description, the Kakuno sounds like a kid’s pen. It’s certainly designed with kids in mind, but in reality it is so much more. It’s a well designed, highly functional fountain pen that anyone can use and enjoy. I know I enjoy the heck out of it. My first Kakuno was the grey barrel with lime green cap. I backed that up pretty quickly with the orange cap model, because orange. At the time, the Kakuno only came in fine or medium nib widths. In the second round of pens - white barrel with pastel caps - Pilot added extra fine into the mix. This is important because many first time fountain pen buyers that read this site what to know if there is an inexpensive fountain pen with a line to match their favorite micro gel ink pen. Pilot extra fine has always been the answer, but there was never an easy way to get the nib. There is now. It’s as great as expected, and the extra fine nib is an added bonus. On my Rhodia Ice Pad, the line width is comparable to the Pilot Hi-Tec-C 0.3 mm gel ink pen. That’s impressive for a fountain pen. The only question remaining is if you can eyedropper the Kakuno. You will need to fill the two holes on the back end of the barrel with epoxy for starters, then add silicone grease to the barrel threads. My only concern is that the feed is friction fit and there is not an extra spot to silicone the nib unit threads, because there aren’t any. Cartridges and converters obviously work fine, but they seal off around the feed post. I’m not sure how ink would handle just floating around that area. Speaking of converters, I used the Pilot Con-70 in mine. This is Pilot’s largest capacity converter, and most expensive as well. You don’t need this one for the Kakuno, but I have a couple not in use so I put it into action. All of Pilot’s other converters will work, as will all of their cartridges. 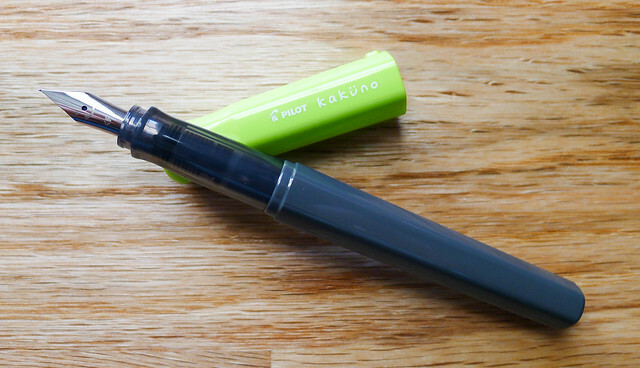 For the clear barrel Kakuno I’d look at using more fun colors, like the Pilot Mixable cartridges. The Pilot Kakuno is a great pen for any level of experience. The most beginning fountain pen user will enjoy its cool looks and ease of use, and the most experienced user will love the great nib and build quality. It’s an all-around great pen. Posted on December 11, 2017 by Brad Dowdy and filed under Pilot, Kakuno, Fountain Pens.